The construction of the “Belt and Road” (B&R) has put forward new requirements for China’s news dissemination. 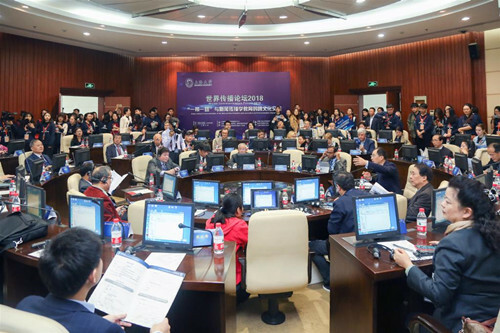 From Oct. 20 to 21, a symposium titled “World Communication Forum 2018: ‘Belt and Road’ and Intercultural Communication of Journalism Education” was hosted by the Shanghai Academy (co-created by the Chinese Academy of Social Sciences and the Shanghai Municipal People’s Government) in joint with Shanghai University in Shanghai. Increasing international communication capability is necessary for improving China’s national image in the new era. Jin Donghan, Party secretary and president of Shanghai University, said that the key to media competition is talent. Therefore, it’s necessary to quicken the cultivation of journalistic talent along with determined political stance, professional performance and integrity. There is still a wide gap between the foreign perception of China and the actual situation of its rapid development and change. This requires Chinese to actively say more about the actual situations and also to strengthen exchanges and cooperation with foreign mainstream media. Zhu Yonglei, deputy secretary-general of the CPC Shanghai Municipal Committee and deputy director-general of its Publicity Department, said that the political and economic landscape of the world today is undergoing profound changes. Countries’ wrestling over open trade and trade protection has intensified, and so has the competition for international discourse power. In an increasingly complex environment, it’s the mission and responsibility of China’s journalistic communication workers to enhance the country’s international discourse power and strengthen its international communication capabilities by telling Chinese stories well, spreading Chinese voices loud and facilitating cultural exchanges between countries and regions, Zhu said. The international order and development landscape in the world today are facing many challenges. How to take the initiative and have discourse power in this complicated situation is not only a test of the governance ability of the Communist Party of China and the central government, but also a theoretical research topic for the academic community. Ma Yuan, director of the Bureau of Scientific Research Management of the Chinese Academy of Social Sciences, said that it’s necessary to strengthen research on major theoretical and practical issues in the field of journalism to serve the country’s strategic goal of international communication, to promote the sustainable development of journalism, and to improve the quality of journalism teaching. China needs more comprehensive exchange in terms of journalism and communication education. Wu Xinxun, a professor at the School of Journalism and Communication at Shanghai University, said that at present, China has more and more cross-cultural exchanges in journalism education with developed countries. In the future, it’s important for China to increase such exchanges with developing countries and regions. Strengthening journalism and communication education is conducive to enhancing mutual understanding between ethnicities, countries and regions. Prabu David, dean of the School of Communication Arts and Sciences at Michigan State University, said that in today’s world, economic globalization is linking the world economy into an integrated whole. The establishment of cross-border friendship requires countries to strengthen education in information and media. Only through education to cultivate empathy can we enhance mutual understanding of other countries, regions and ethnicities, thus reducing prejudice and conflict.